The new flagship in Antec's Gaming series, the Eleven Hundred, brings ultimate gaming builds to life. The Eleven Hundred's nine expansion slots and space for an XL-ATX motherboard accommodate elite GPU configurations up to three-way NVIDIA® SLI® / four-way AMD CrossFireX™. An included top 200mm exhaust fan, rear 120mm fan and up to seven more optional fans in strategic positions - including behind the motherboard tray - keep all your components comfortably firing on all cylinders. The Eleven Hundred also lets you organize a clean, powerful build with superior cable routing, including 36mm of space behind the motherboard tray and grommet-lined cable routing holes. 21.50" x 9.30" x 20.70"
The new flagship in Antec’s Gaming series, the Eleven Hundred brings ultimate gaming builds to life with a new set of advanced features and dynamite aesthetics. The Eleven Hundred’s nine expansion slots and space for an XL-ATX measurement motherboard (10.3” x 13.6”) accommodate superior GPU configurations up to 3-way NVIDIA SLI / 4-way AMD CrossFireX. If you intend to go big on performance, you’ll want to back your system with unparalleled cooling. A top 200 mm exhaust fan, rear 120 mm fan and up to seven more optional fans in strategic positions – including behind the motherboard tray for added CPU cooling – keep all your components comfortably firing on all cylinders. The Eleven Hundred also lets you organize a clean, powerful build with superior cable routing, including 36 mm of width behind the motherboard tray and grommet-lined cable routing holes. For an elite gaming experience, gear up with the Eleven Hundred, the Advanced Gaming Authority. Pros: I have had this case for several years now, and have loved it for the most part. Lots of room, plenty of areas for good cable management, and it helped get me to learn new things about building that I hadn't yet gotten to so far. Cons: Weight. This thing is monstrously heavy, and at times when I've had to lug this bad boy around by myself, opening doors is a nightmare. Top fan mount is apparently not compatible with some newer fans out there. Top fan broke after 3 years - as in, its electrical housing has come loose to the point that the thing rattles if I run it, which initially was causing some noise and then after trying to fix it and reinstall it began wobbling heavily to the point I had to remove it. Other Thoughts: The side panel fan mounts are a little strange to install fans into with the little rubber screws that come with fans these days, and can potentially cause grief with your CPU heatsink or GPU card if any of those components are overly large. Pros: Very spacious & good to work. Other Thoughts: NOT THAT SOLID. Pros: good cable mgt . large & roomy . Cons: no filters on side/ weak metal/ tooless drives should be type that holds a ssd / cheap plastic parts /poor feet/. Pros: It fits everything I needed to put in there and then some. Has plenty of places where I can mount fans. Cons: The clips inside that held the drive covers were easy to break, but it was my fault for not reading the manual. I had thought they were clips that could snap back like ram clips or something. Other Thoughts: For the price, I honestly think this was a great purchase and I would totally recommend it. Pros: I'd find those happy thoughts, but not in this post ANTEC. 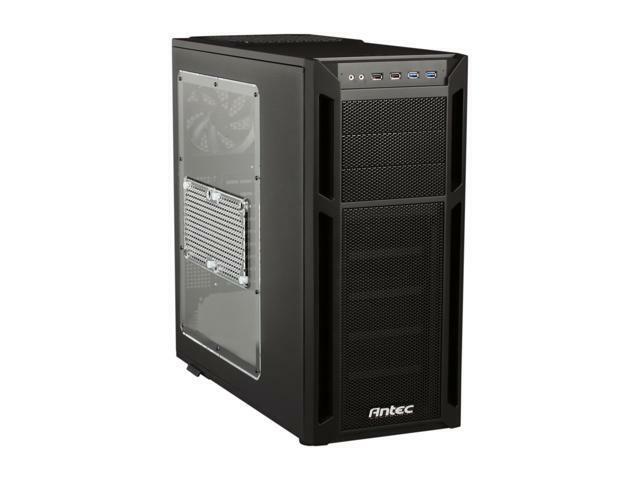 Cons: What I'm REALLY not happy about, is that this case doesn't come with a 200mm fan, nor a slot for one. IT DISPLAYS A 200MM FAN IN SEVERAL OF THE PRODUCT PHOTOS, AS WELL AS IN THE SPECIFICATIONS INFORMATION. Basically, the Spec's page is incorrect, as well as the pictures that accompany this product. 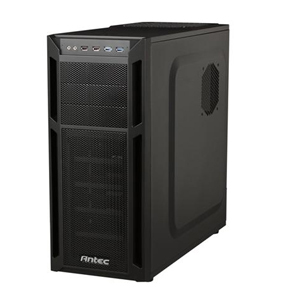 Other Thoughts: Extremely poor mistake from BOTH Newegg and ANTEC. I specifically wanted a case with a larger fan to help with airflow. Either way I'm keeping the case, because I can't possibly think about returning fees, let alone paying ANTEC another dime of my money. 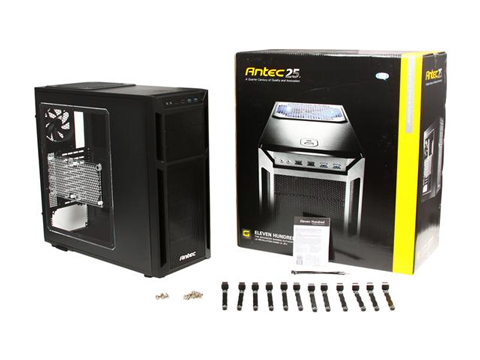 First and last time buyer, ANTEC. You suckered me once. I think there has been a misunderstanding, I believe you ordered the Version 2 of the Eleven Hundred, which comes with 2x 120mm fans instead of 1x 200mm Fan. If you have any further question please call us at 1-800-222-6832, we'll help you out the best we can. Everything just coming up too short, or the case design wouldn't allow me to extend a wire just enough, or the wire length used to run it through the allocated space made it near impossible to get this thing assembled, I know it has to do with my parts but even my SSD won't fit into the designated port and is currently laying at the bottom of the case like a piece of trash. Also, how do you make a HD mount, and SSD mount, Three expansion bays and only include two SATA cables, Very naughty antec. Other Thoughts: I'm happy with the case, the pros do outweight the monstrous set up difficulties, and there really is no con in terms of functionality. Those 5 hours cussing and smoke breaks, really left their mark on me. Other Thoughts: I bought this case on the 28th of Dec 2013. When it arrived on my door step the box was damaged (not the best sign). When I opened the box it looked okay but when I took it out I heard rattling from within (great). So I discovered upon further inspection that a mere two pegs that held the front panel in survived shipping, the rest were what was rattling around inside the case shattered beyond belief. I had to RMA through newegg and they had no problem sending me a replacement. Oh it gets better. I just received the replacement but this time NONE of the pegs made it through shipping. Common guys just because there's no label that says "fragile" on the box doesn't mean you should throw the thing around and treat it like trash. I'm not even going to RMA this one, just going to send it back. Nice case but not worth the effort. Not sure whos at fault for the damage whether it be newegg (doubtful) or the shipping company.